Following the huge success of our MC7700QCP we’ve taken all the best and easiest to use features and created a fantastic introductory level long-arm machine … the Memory Craft 8200QC. The sheer length of the arm space is impressive at 11″ ( 280mm ) .. ideal for large quilts, bridal dresses and those bigger home furnishing projects. As with all Janome sewing machines stitch quality is a priority. With a built-in AcuFeed system for precise fabric handling and and easy change needle plate to enhance straight stitch performance … rest assured this machine offers spectacular stitch quality. And we’ve increased the stitch width to 9mm! Shadow free lighting is provided by 5 bright white lights whilst quick and easy stitch selection can be made on the large touch screen or keypad. Choose from over 200 stitches including alphabets and numbers, and 7 styles of automatic buttonholes. Memorize a combination of these and save them for future use! Patterns can be elongated up to 5 times standard length. 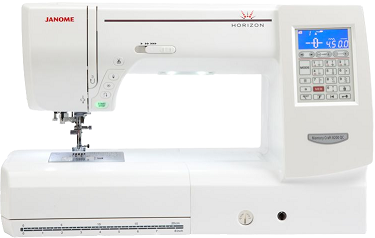 Other special features include an automatic needle threader, a speed controller to set your maximum sewing speed and a stop/start button if you choose not to use the foot control. It also has a needle up/down button which programs the needle to either finish in the up position or in the fabric… great for pivoting on corners!